Steven Gerrard felt the world was against Rangers during their 1-1 draw with Aberdeen. 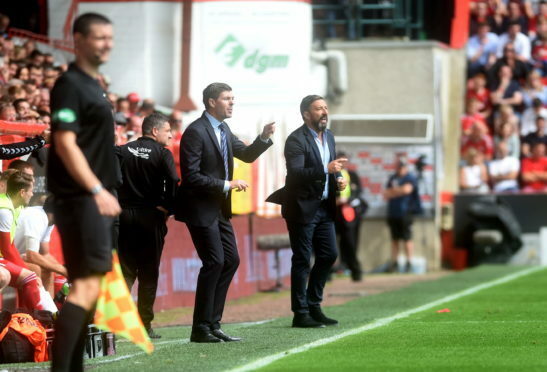 Aberdeen manager McInnes believes every club is on the receiving end of a perceived injustice at some stage, pointing to his side’s grievances over Shay Logan’s ban for his sending off against Celtic at the end of last season. Gerrard’s remarks after the 1-1 draw at Pittodrie last Sunday centred on the dismissal of Alfredo Morelos for kicking out at Scott McKenna, a red card which was overturned on appeal this week. The Rangers boss said it felt like “the world is against us” after the game. The Dons have experienced the inconsistencies of the appeals process themselves, with Logan handed a two-game suspension in May for his sending off at Parkhead. He was already due to serve a one-game ban for exceeding the disciplinary points total. McInnes said: “I don’t think you are ever surprised with these things. But it’s not isolated to one club about being harshly treated, I think that’s clear. For example, we feel aggrieved that Shay Logan is suspended at the moment for the final game of the season. “I said at the time I felt he got involved but having looked at the footage and having spoke to the referee I don’t see a red card offence. But Shay has ended up with an added two-game ban for what was just a little scuffle. There was no physical contact, there was no kicking out or anything like that – there was nothing. “We appealed that extra two-game ban but it was unsuccessful, so we are feeling the consequences of that. We feel harshly treated and it happens to every club, things go for you and things go against you. Certainly, we are now without a player where I believe there was no red-card offence committed. Yet other players are available. Logan is not available until the Dons play Hibernian on August 25, adding to their defensive struggles with Scott McKenna (hamstring), Mark Reynolds and Tommie Hoban (both knee) already ruled out. McInnes wants to strengthen his squad further but the English transfer window closing earlier this year is holding up the process.